Tensions in society sometimes reach a boiling point if not taken care of, leading to revolutions. How do they work and are they avoidable? 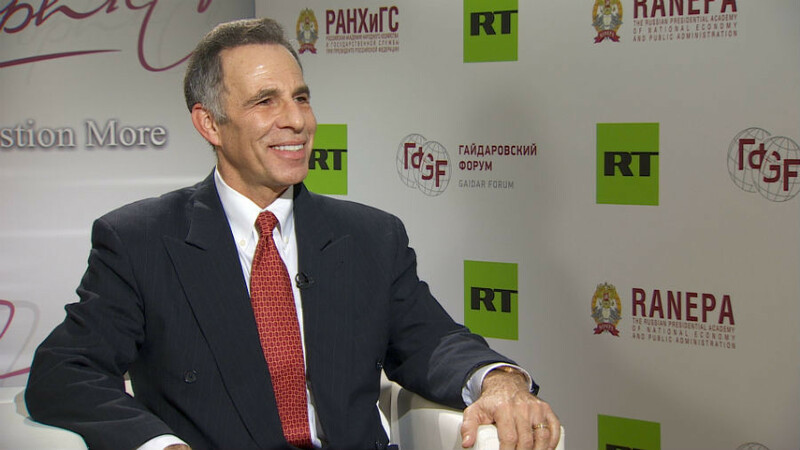 We ask Dr. Jack Goldstone, former consultant to the US government and professor of public policy at George Mason University. Sophie Shevardnadze: Professor Jack Goldstone, it’s really great to have you on our programme today, welcome. Jack Goldstone: Thank you, it’s very nice to be here. SS: Let’s start with Tunisia. I remember that it was seen as the Arab Spring poster child. Now, 7 years on, this year has started with yet new protests and people are saying that hardly anything has changed. So why is it viewed as a success story? JG: If you compare the conditions in Tunisia with those in Libya, Syria or Yemen it still looks great by comparison. Revolutions in general are messy and uncertain. If you look at the situation in Ukraine after the 2014 revolution the transitions are all difficult. At least Tunisia is not in the civil war. JG: Well, I wouldn’t say nothing has changed. You have groups that are now active in politics and previously were shut out. You have different coalitions forming. What you don’t have is a kind of idealised utopian transition to Denmark, right? You don’t take a country that was middle-income, corrupt and authoritarian and instantly create a somehow rich modern peaceful country. It takes a long time to complete that transition. Tunisia’s having problems, that’s to be expected, but it hasn’t yet collapsed and that is worth applauding. SS: If you look at the Arab world it is only home to 5 percent of the world population, yet it accounts for half of the terrorist attacks that take place in the whole world. There’s still so much poverty and so much instability. Young people are growing more and more unhappy. Do you think there’s a chance for a new Arab Spring, a new revolt? JG: Well, wherever there’s injustice and deep inequality there’s always a chance of a revolt. People get angry about injustice. They will tolerate poverty, they will tolerate slow progress if they think their government is working in their interests. But once they believe that the government is no longer taking care of them anyway, if the government officials are simply enriching themselves you have the risk of revolt. I think, certainly throughout the Arab world that risk will continue. SS: So, in a nutshell, if we assess the whole Arab Spring that took place 7 years ago, would you say that it brought the region any good or we’re pretty much where we started off? JG: I would say the results are mostly negative. But, again, you could have said the same about the French revolution in 1789. It started off with great ideals and it plunged the entire continent into war. The nature of revolutions is that they nurture wonderful dreams, they often run into difficult painful realities, but in the long run of history revolutions often serve the role of creating a change, creating a space for something new to develop. We don’t know how long it will take. JG: No, we don’t. In that sense a revolution is like giving birth: you don’t quite know ten or twenty years down the line what type of person your child will grow up to be. But you need to have birth in order to have change. SS: You brought up Ukraine, and obviously the revolution in Ukraine brought big hopes and people are now saying that the situation is so bad that they might as well have a new revolution. I was wondering, if a revolution happens once do revolts destabilise countries to the point that the countries are prone to fall into this time and time again? SS: You mean, no deaths? JG: I don’t mean no deaths, I mean, you don’t have mass terror and civil war. It’s hard to have a revolution without some number of people, a few dozen, a few hundred and maybe a few thousand. But the great revolutions killed anywhere from tens of thousands to millions. So the color revolutions are more peaceful by comparison. But they also tend to be less complete in the changes they bring. You don’t have a new government that completely extinguishes its enemies. You don't have a new government that develops new sources of revenue or new ways of doing business. It’s rather a partial change. And for that reason there are a lot of problems that remain unsolved. There’s always a risk of going back. There’s what I call a ‘partial’ or ‘incomplete’ change that has the potential for regression or further progress. But in either way it’s not yet complete. SS: What does it take for a successful revolution? Are revolutions just lucky revolts? I mean, does it take more than a coincidence, an angry population to make it a successful revolution? Or is there much more to it? JG: If it was that easy it would be more revolutions in history than there are. In order to overthrow a regime it does take a popular discontent and popular mobilisation. But it also requires actors within the leadership of the regime who feel that the regime is no longer serving the national interests. You need people in the military or the bureaucracy or both who are willing to see the regime change. Otherwise they will be able to put down a popular revolt that didn’t have support at higher levels. SS: I want to talk about America a little bit because it has seen a rise in more radical movements recently - we see the Black Lives Matter, the alt-right on the other flank. These groups aren’t prone to dialogue and compromise. They’re actually quite uncompromising. Is there a chance that they could radicalise American politics or do you think they will pass? JG: Well, if you talk to a lot of people in America, they feel our politics have already been radicalised. Democrats and Republicans are not talking to each other that much. President Donald Trump seems to be something different, he’s not a conventional Republican, he’s certainly not friends with the Democrats, he seems to represent something else - what he calls ‘the voice of the forgotten people’ by which he means rural, small-town traditional America which is not well-served by the forces of globalisation, automation, meritocracy. And so we essentially have a radical popular movement aiming to restore something like the America post-WWII when America felt, it seemed, the dominant country in the world. That’s what a lot of Americans are longing for. SS: Yes, and also the Black Lives Matter, the alt-right flank - do you feel like they have a real chance of succeeding and getting somewhere with Trump being at the helm of the country? JG: Well, Black Lives Matter is succeeding in bringing a police reform. A lot of people were quite distressed that we now require police wear cameras when they carry out arrests so that we have a record of what’s happened. But let me point to another radical movement - that is the hashtag #MeToo, a movement to say the traditional ways that men have interacted with women are not going to be accepted anymore. Yes, we live in a patriarchal society but that doesn’t mean men in power can impose their will on women or men who are their juniors. And this has led to the downfall of some extraordinarily wealthy and powerful white men in America who thought they were untouchable. SS: I’m thinking about massive protests in the U.S. that have taken place in recent years, like there are millions marching against the war in Iraq, a lot of people rioting against police killings of black people unjustly, sit-ins at the Dakota pipeline. They really have brought nothing. Why is that? Why are protests of today weaker than, let’s say, those of the 60s because they really made ground? JG: That’s a very good comparison. I grew up with the riots of the 60s and they had an enormous impact on civil rights, women’s rights and, of course, ending the U.S. involvement in Vietnam. Right now the movements that we’re seeing tend to be specific to a particular cause, as you said, stop the pipeline here, deal with police brutality, focus on women’s problems. The great thing about America is when people want to express themselves they have the right to protest, to assemble, to create sit-ins, disruptions and that has always been a healthy part of American politics. It’s less effective now because the people who are looking for a change haven’t come together in a broad national movement. Instead you have a number of limited movements. Now, in American history when there’s a time of major changes the little movements sometimes come together and produce a big outcome. I think that was the case in the 1960s. It may be the case in 2018 if there’s a transformative democratic wave that leads to electoral change, perhaps, we’ll see movements come together. But we don’t know yet. All I can tell you is that there’s potential but so far it remains divided. SS: You’ve said many times that people need to come out to the streets and protest from time to time to remind their governments what they want and why they’re unhappy. But should this always end in overthrowing the government if the protesters are, for instance, ignored by the government? JG: No, of course not. The advantage of a democracy is that people can vote to change the government without having to overthrow it in the streets. And indeed one could argue that the election of Donald Trump was a major protest against both of the mainstream political parties by people who felt like ‘we need a huge big change’. And they could accomplish that at the ballot box even though voting is often supported by popular organisations and demonstrations. The two essentially are the complementary parts of democracy, they are not widely different. SS: If you look at riots and revolutions generally, people who can get themselves out from a couch, go out to the streets and protest and be very adamant about it, are the active ones, right? SS: But then the silent majority, the majority of the country, they are just too lazy to go out and they sit at home. Or, maybe, they are not lazy, but we don’t know what they think. How is it fair to judge that a massive protest is an expression of the whole country? JG: Well, lazy is not a good description unless you’ve gone out and interviewed people and asked why they’re staying home. A lot of them simply have jobs and families. SS: And they are happy with everything probably. JG: We don’t know that they are happy. Here’s what we know: in countries with a very youthful population you tend to have larger, more radical and more ideological revolutions. That’s because young people are wide-open into the future, they are not tied down with family obligations, they are willing to take risks, they are often more excited by the idea of change. When you have a population that is older it’s harder to get people into the streets, usually it only happens if there’s some process underway that has already got people think about change into the future. The people who stay home, they are not usually lazy. They are fearful and waiting to see: is this really an opportunity for a change? Am I going to make a difference? Or is this something I’d better sit out and wait for a better opportunity? JG: Young people are a great force for a change. It can be positive if an economy is doing well and young people feel confident in their future, if they can invest in their education, if they can get jobs, build families. A country gets richer as a result of having a youth bulge that is given the opportunity to create wealth. If, however, you have a youth bulge that is educated and can't find jobs or is forced into dead-end jobs that don’t offer much to the future, they can’t get resources to build families, then you are creating a tinderbox of ambition that is not being satisfied and may turn to protest or even violence if the opportunity comes. SS: If we follow that logic does that mean that the country that has an aging population has nothing to fear in terms of social unrest? SS: The government of a country that is mostly made up of young population - how do they make sure it doesn’t necessarily turn into a revolution if things aren’t going to well? JG: If things aren’t going too well it’s difficult to avoid anger. So it’s necessary to start to give people an opportunity to see a real change. So giving younger people opportunities to join leadership organisations, investing in not just education but actually jobs that allow these people use their education, starting new projects, building new research centres and communities, encouraging foreign investments - all these things can help younger people who are ambitious feel ‘you know, this government is giving me a reason to have a stake in the future, it isn’t giving me a reason to give up hope’. SS: And then there’s a money factor, of course, that I want to talk about. Apart from bigger deep ideological causes when people go out and protest, it really just comes down to money. They need hot drinks, blankets, weapons. So is this really about who funds the revolution? Is the success of the revolution decided by who funds it? JG: I don’t think you can put down the success of the revolution into who funds it simply because once people become sufficiently energised and anxious to create a revolution, they are willing to take considerable risks.They are putting their lives on the line. And they are willing to endoor quite a bit of hardship to make a change that they thought might never come and now they’ve got a chance to realise that change in their lifetimes. Yes, if there’s going to be a revolutionary mobilisation, people do need to be fed, they do need to be provided for. But that usually comes from their families, it may come from local businesses who want to support a change, it rarely comes from outside. And the reason is countries that want to intervene in revolutions, first they want to see which way things are going to turn because they don’t want to back a loser. Second, they usually prefer to intervene with military force rather than just funding because intervening with some military force gives them confidence: ‘Hey, I’m a foreign power, I want to influence events in this country. If I just give money I don’t know where that’s going to go and what’s going to happen. But if I can give military support to my side I have greater confidence that they are going to end up on top’. SS: Some could argue that revolutions can be great investments. The Syrian uprising was funded by the Gulf states; the Bolshevik revolution was funded by the Germans; the National Endowment for Democracy helped revolutions in Serbia and Ukraine. Could you say that that is profitable to invest in a revolution? SS: Invest in a revolution? JG: To invest in revolution. SS: America has used regime change as a foreign policy tool quite a few times even after the Cold War - and just a few of the consequences among others were the Taliban and ISIS. can you spark a revolution and then tame it? JG: Usually not. More likely you’ll get a backlash. And I think, the cases you’ve pointed out are good ones. SS: So don’t invest in a revolution because of the consequences you have to endure afterwards, right? JG: Worse than that. At the end of the day revolution’s gains strengthen nationalism. A revolutionary government usually justifies change by saying ‘our nation that’s special and that we love will be better after we have a revolution’. If a foreign power is too strongly identified with a revolutionary movement it can lose that nationalist appeal. So it’s just not a good idea for foreign powers to think ‘yes, we’ll be able to control a revolution, we’ll be able to back it’. Often supporting a revolution just leads to a backlash against the foreign power and an assertion of native nationalism that’s against foreigners. SS: Is it fair to say that revolutions of today always have a nationalistic tint to it too? Because if you have to look at the Communist revolutions in the past century, they were organised by very strict, lean parties. And if you look at protests now they look like disjointed forces of people who are protesting. Do protests of today not need an organising force anymore to lead them? JG: Let me ask you about human nature: do you think it’s mainly rational or emotional? JG: And the emotional side of humanity is what nationalism appeals to. So revolutionaries often start with a rational plan. We have an ideal of equality, we have an ideal of communist redistribution of goods, we have an ideal of building a society that follows the Quran - they are beautiful moral ideals that inspire people to make revolution. But at the end of the day to bring the masses over you need an emotional appeal and that is most commonly found through nationalism. So whether it’s the Communist Revolution in China, the Russian Revolution, even the American Revolution - at the end of the day (which means after a decade, two decades) what you have left is a strong nationalist attachment to the new revolutionary regime. That’s what ends up winning at the end. JG: That’s correct. What we find in the history of revolutions is the serious technological jumps in communication - the printing press allowed pamphlets to play an important role in the period in revolution, the French revolution in the 17th and the 18th centuries. The telegraph and radio played an important role in revolutions. Cable television was probably a bigger force than social media in igniting broad revolutionary movements in the Arab Spring. It was the televising of protests and self-immolation stories. All of that really got out more through Al Jazeera than the social media. The next round may be social media or may be something else. Maybe a Bitcoin financed revolution will be the next move. What we do know is that people who want change will take advantage of whatever technology is available to try and get around government control. And then after the revolution the government will try and control the new technology. We see that in China with its Great Firewall using the internet more for the purpose of government management of society than opponents can use it for change. SS: Professor, you’ve been studying revolutions all of your life - you probably have an insight into where the next revolution may take place? Give us a hint. JG: Let me put it this way. I wouldn’t trust people who have been playing the stock market all their lives to tell me where the next stock market move is going to be. Everybody missed the big downturn in 2003 and in 2009. Experts missed the collapse of communism, they didn’t expect the Arab revolutions. So I tell people, revolutions are like earthquakes. They are big powerful changes but that doesn’t mean we can predict exactly when and where they will occur. Rather what we know about earthquakes is where the major fault lines are. I can tell you where the major fault lines are for revolutions. They are in countries that have weak governments, elites that have ethnic or other divisions and populations that are still anxious for greater change than their governments can deliver. You see a lot of those in Sub-Saharan Africa, parts of the Middle East, some of the countries in South-East Asia and those along the Andean spine of Latin America. Those are the areas that I would watch with a higher likelihood of revolutions in the future. But just like the big Japanese earthquake a few years ago that took place on a fault that geologists hadn’t met because it was fairly deep, we might see a revolution in some place where we haven’t yet mapped out the fault lines: if there’s a popular uprising, say, in Hungary against the new strengthened party government… It may be in Turkey against Erdogan’s newly authoritative regime. The possibility of revolution is always there if people sense injustice and an opportunity in the weakness of the government. And that’s why I tell people, until you live in the world where everybody is confident that their future will be bright we will see the risk of revolution coming back. SS: Professor, thank you very much for this interesting interview and insight in the world of revolutions. Good luck with everything. JG: Thank you, it’s been my pleasure.